In Starlink: Battle for Atlas on Nintendo Switch you're part of a group of heroic interstellar pilots, dedicated to free the Atlas star system from Grax and the Forgotten Legion, an evil robot force. Drop-in/drop-out split-screen co-op. Each physical toy unlocks a digital copy when connected to a controller mount. Two players can play with the same starship, one physical and one digital right away. 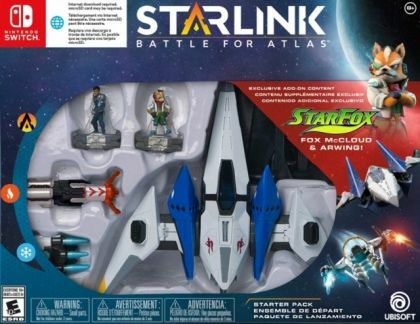 Fox McCloud appears as a special guest pilot in Starlink: Battle for Atlas. Players have the opportunity to explore the open star system of Atlas in Star Fox's Arwing and team up with the Starlink Initiative to help stop the Forgotten Legion.